We don't learn everything in school. There are many people who might have an impressive degree and can do calculus, but when it comes to public speaking or cooking a tasty meal, they don't know where to begin. 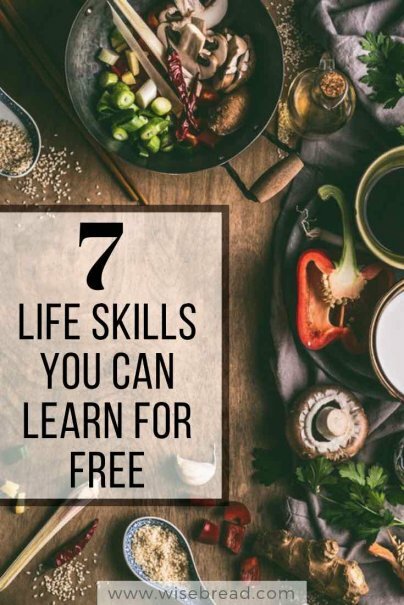 Here are seven basic life skills everyone needs to know, and how to learn them for free. Rather than learning basic personal finance skills in school, many of us have had to learn financial lessons through costly trial and error. Learning to stick with a budget means you can avoid and pay off debt, save for retirement, and eventually be able to buy a home or splurge on a dream vacation. Even though many will not choose a career that requires constant speeches, like a pastor or politician, all of us will need to speak publicly at some point. Whether it be for a work meeting, a wedding speech, or a eulogy at a funeral, you'll have to get up in front of a group of people and not pass out from nerves. You can audit the University of Washington’s public speaking course through Coursera for free, or rent books with tips on how to master this skill from your local library. You could even practice monologues in front of a mirror or for a group of friends. Reading at a faster speed while maintaining comprehension can help you enjoy more books in less time. And depending on your line of work, it can also help you perform your work tasks at a quicker speed (and hopefully getting a bigger raise). There are a few free speed reading courses through Skillshare and other free education platforms. One notable course on Skillshare is Speed Reading Mastery from Jordan Harry, a TEDx speaker who says he can read 1,500 words per minute. Skillshare does have a monthly fee of $15, but you can get the first month for free and take unlimited classes during that introductory period. If mastering a second language is on your bucket list, then stop waiting for enough free time to get started. You can learn a new language by committing to 15-30 minutes a day with free audiobooks from the library or free online courses. There are so many elements to cooking, but everyone should feel comfortable enough in the kitchen to whip up a tasty meal with ingredients they have on hand. When you can look in your pantry and fridge and turn staples into dinner, you won’t be constantly tempted to order takeout. Jamie Oliver has several YouTube videos on kitchen basics, such as roasting a chicken or making perfect scrambled eggs, along with how to make classic dishes like spaghetti carbonara. Once you've mastered the basics in the kitchen, take it to the next level with Gordon Ramsay’s YouTube lessons. And since you're not a contestant on Hell's Kitchen, you won't get yelled at if you make a mistake. Just learning the basics of sewing can save you tons of money because you'll be able to repair minor rips, reattach buttons, and even hem pants that are too long, instead of buying new clothing items all the time. You'll also be equipped to adjust your clothes or your children’s clothes during weight fluctuations or growth spurts. The internet is full of free sewing tutorials and patterns, but a good starting place is Made Everyday’s sewing lessons on YouTube. You can audit this free business writing course from Coursera, which covers how to write effectively in the business world and how to avoid basic grammar errors. Financial writer featured on CBS News, Business Insider, and MSN Money.